For fast and effective sore throat relief, use saltwater gargle, along with this herbal mouthwash formula. Allergies, dry air, and pollution, and illness such as the common cold, flu, measles, mononucleosis (mono), the croup and chickenpox, can all cause sore throat pain. These are viral infections that usually don't respond well to antibiotic use, but a few herbs along with Apple Cider Vinegar may be just what you need to soothe the pain and irritation. Bacterial infections are only a small percentage of the reason for getting a sore throat, there may also be other complications linked to a serious infection. In these cases, calling your health practitioner is a must for those who suffer from a severe sore throat, especially when accompanied by fever, or there is swelling in the tonsils that block the throat. Apple Cider Vinegar is thought to have antibacterial properties that help to fight an infection that may cause sore throats. The acidity of vinegar decreases pH of the tissue, which can help prevent bacteria from growing on its surface. Raw Apple Cider Vinegar has the prebiotic inulin present, which may increase your white blood cell and T cell count, and help to boost your immune system. It has long been used as a treatment to heal and relieve pain naturally. This miraculous brown liquid helps by reducing inflammation and tightness, as well as the burning sensation that makes it difficult to eat and drink, or even swallow. It also delivers a variety of vitamins and minerals and makes a great daily supplement for your body. Sage (Salvia officinalis) has astringent, antiseptic and antibacterial properties that have a long history of use for coughs, soothing sore throats and for mouth inflammations. Sage is a classic gargle, to ease a strained throat. Myrrh Gum, aka Guggul (Commiphora molmol), is also a very good herbal tincture for oral care. It has antimicrobial, as well as antiseptic, anti-inflammatory, and anti-catarrhal actions. This can be very used in a gargle, or mouth rinse, to help with oral thrush, gum disease, or gingivitis, mouth ulcers, bad breath, as well as for sore throat pain. Internally and externally, Myrrh gum works to heal infection and clear poisons from the body. Myrrh resin is a known killer of harmful bacteria and it is said to stimulate the activity of white blood cells in the body. Myrrh tincture is a well-known remedy for inflamed tissue and may even have anti-cancer properties. Goldenseal Root (Hydrastis canadensis), is an herb that has often been used by herbalists for its ability to fight infection, particularly infection of the mucous membranes. Clinical trials prove that it kills many harmful bacteria, as well as protozoa and yeasts. It is considered one of the most powerful herbs on the planet and has been used as a substitute for quinine. 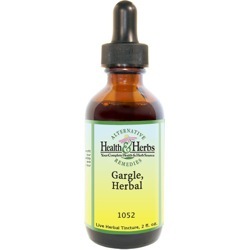 Goldenseal root tincture is believed to help in infections of the throat, bronchial tubes, intestines, stomach, eyes. High in berberines, it is a power anti-inflammatory and antibiotic specific to these areas of the body. Bayberry Bark (Myrica cerifera) is an astringent herb that helps to firm and tighten the gums, as well as cleanse them. These astringent qualities are also believed to be valuable in treating, chronic catarrh of the sinuses, as a gargle or rinse for sore throat pain, mouth sores and tonsillitis. Cayenne Pepper (Capsicum Minimum), works because of powerful, active ingredient called capsaicin. This has been a popular home remedy for many years for soothing sore throat pain naturally, and effectively. The compound is an anti-inflammatory and antibacterial that helps to reduce swelling and helps to eliminate infections. Cayenne pepper extract is also a modulator that works by blocking the pain signals from reaching the brain. Cayenne pepper has been shown over and over again to provide instant pain relief that lasts up to two hours. You should not use Cayenne on open sores. Instructions: Use 1/2 tsp. in 1 cup of distilled water or adjust as desired. Shake well. Store in cool dark place. Keep out of reach of children.